10 Health Benefits of Apples | Eat This! 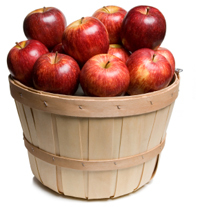 10 Comments on "10 Health Benefits of Apples"
This site is awesome. I found that mangosteen helped my reflux, arthritis and cholesterol. But it is kind of expensive, I recently heard ABOUT APPLES and reflux and was so excited to get instant results. I firmly believe that God created all and that in His Creation healing answers can be found. A very great writing and very informative. i am inspired from your article writing techniques. I didn’t know that it’s good for the bones. Based on my own experience, RED apples beat all antacids anytime in providing a safe and natural remedy for the cure of heartburn. Very useful information, I normally eat one apple per day. And I feel much better. I’ve forced myself to eat one apple a day after I am done my workout after work on a daily basis, while I am driving home. I have oatmeal in the morning, light lunch and an apple a day. As a result, my cholesterol was from 325 to 166 with in a year. You got to believe it. Now I am in very good shape, happier and healthier. Thanks.